I know what id10t is but what is PICNIC stand for? Odd that Eufy does not merge powerline with smart plug so it uses the electrical cables with sending messages. Next innovation? Ok, I thought it was something like that. I've heard of PEBKAC but not PICNIC. 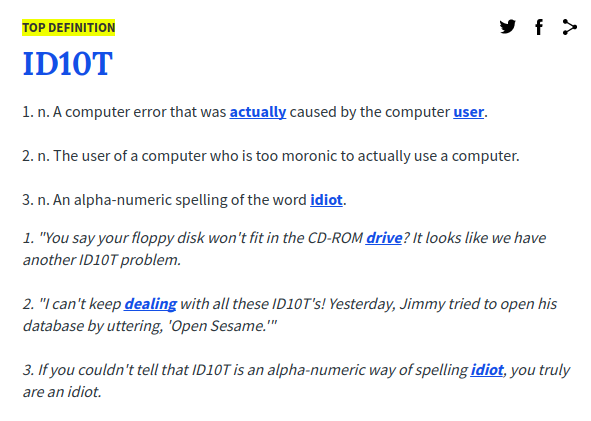 As for id10t, I knew about that from a joke I read years ago. Thanks for the clarification. Review on Amazon seems to identify an issue with the power switch. It would seem from Anker’s reply that it is designed so sensitively like that to allow shut off as quick as possible??? The surge protection should kick in despite any action on the button but understand that a cable could be pressing down on the power button and it would turn the unit off which is where the real issue is i believe and that shouldn’t happen. This would be good for behind an entertainment center (or home theater) with many different components. I have one. It's a little heavier than a normal power strip but that's to be expected because it's got the capacity of 3-4 traditional ones. I like the arrangement of the outlets makes it possible to arrange different types of cables and AC adapters. I don't really use the USB ports because I'm using Anker wireless chargers that run at 3amps. These are only 2.1amps. It's a great upgrade! I saw this on the Power User page for a coupon code which saved you $10. I will eventually get one or two of these.I love the idea built in power IQ ports. I have one in my amazon cart to buy when I have the money. My product review would say "Cost effective NO BRAINER "
Not sure why everyone keep putting USB plugs on these. 12 plugs + USBs seems a little more then I would ever need. I love the way the outlets are are turned to fit plugs however. Given that many families have and utilize multiple plugs for their devices, using sine thing like this can help eliminate all the added plugs and frees up additional space for other things. Not to mention sometimes these type of plugs with usb ports provide a faster charge than the standard plug in they are using.